We are having beautiful weather today in Northern California. What a fun dessert to make. My granddaughter gave me a cupcake plunger for Christmas and I used it to core the cupcakes. 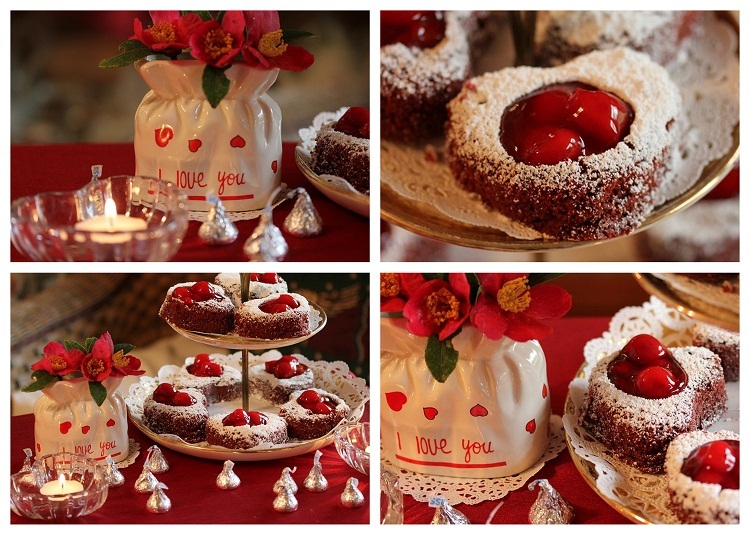 I filled the 'LOVE MUFFINS' with cherry pie filling and sprinkled the cupcakes with powdered sugar. 2. Prepare cake mix according to directions, adding cocoa powder,eggs oil, and water specified in recipe. Add food coloring. 3. Bake for 20 minutes or until done. 4. Let cool on a wire rack. Paper liners or molded pans work great for this dessert. I used tin foil heart molds. Celebrate Valentine's Day with a treat that says "be mine"
My 'Yuletide'camellias are still blooming even with the rain a few days ago. I found a few blooms to put into my 'I Love you' vase. Tablescape and the rest of the story. We never can have too much chocolate. Your love muffins look delicious! Thanks for the recipe. Enjoy your engagement anniversary! What a perfect Valentine engagement anniversary treat! They are really sweet and yummy too, no doubt about it. I love your tea table and I'm sure your sweetheart will too. 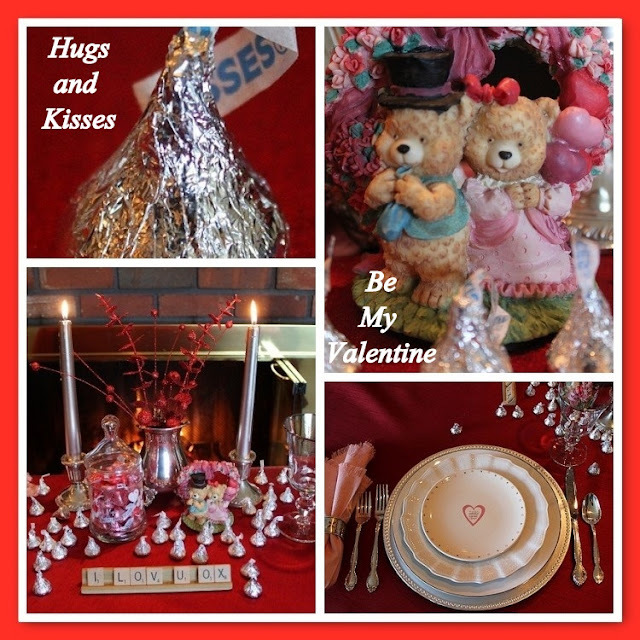 Thank you for sharing with us and Happy Valentines Day! Your love muffins look decadent! Boy, would my DH like them. Congrats on celebrating VD for 52 years; you two are dedicated sweethearts. What a beautiful dessert! Stunning photography too. What a sweet Valentine dessert. I just finished making chocolate (white and milk) tart cups filled with a cream cheese filling and topped with fruit. Nothing says "I Love You" like a sweet treat. I love your beautiful Camelia blossoms! Happy Valentines to you and hubby. Visiting from Rose Chintz Cottage. Now a new follower. whow, those cupcakes look really fantastic. You made a wonderful Valentines table. Happy Valentine and congratulations for such a long time together. Your love muffins look delish. Love the vase too, it's pretty. Oh goodness me, I just want one! They look scrumptious and yummy! Thank you for the recipe sweet friend. I love all the other pics. HAPPY VALENTINE'S DAY! What a marvelous celebrating with you gorgeous and decadent love muffins. TY for the recipe and I would love to try this on Saturday. Happy VD on our Table Top Tuesday. What could be more perfect than these red velvet confections! I hope you are having a marvelous Valentine's Day!